PEAKS is an acronym for "Platform for the Efficient Analysis and Secure Composition of Software Components"
A fundamental building block in making software engineering more efficient is the reuse of existing components and libraries. Applications are composed of a stack of libraries in conjunction with the respective business code. 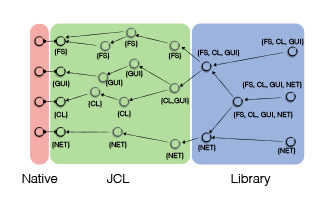 But as the code of the libraries becomes a part of the control flow of the application, it will run in the same process and thus in the same security context as the main application regardless of the actual need for such a privilege. We aim to build a tool to detect these unnecessary permissions in software libraries and to recommend procedures to limit these privileges or their impact. 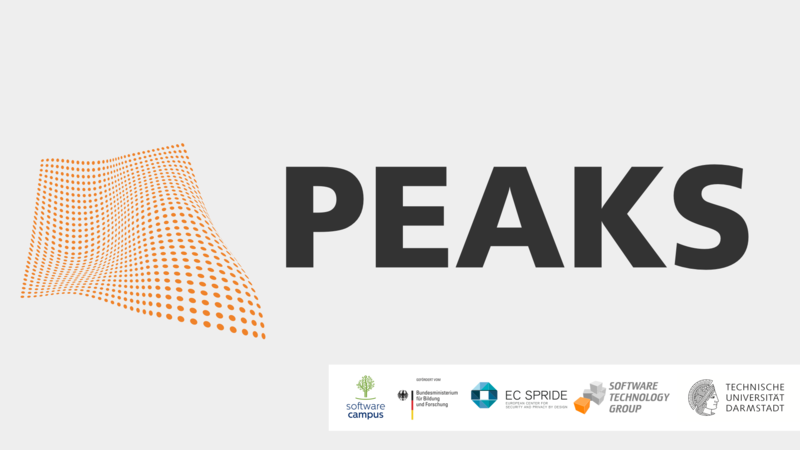 PEAKS was funded by the German Ministry of Education and Research (BMBF) (Reference no. 01IS12054) as part of the Softwarecampus initiative. Ever wondered what system resources the library you are about to include into your software project uses? We can find out for you! Configuring Soot to run your analysis can be a tough job. We have a fluent interface that can help you. Do you have a large evaluation base to run your analysis on? Tired of rerunning the basic analyses when only your specific analysis changes? We developed OSGi modularity for static analysis to counter this. Ben Hermann, Michael Reif, Michael Eichberg, and Mira Mezini. Michael Eichberg, Ben Hermann, Mira Mezini, and Leonid Glanz. Johannes Lerch and Ben Hermann. In Proceedings of the 4th ACM SIGPLAN International Workshop on State Of the Art in Program Analysis (SOAP 2015). ACM, New York, NY, USA, 26-30. Michael Eichberg and Ben Hermann. In Proceedings of the 3rd ACM SIGPLAN International Workshop on the State of the Art in Java Program Analysis (SOAP '14). ACM, New York, NY, USA, 1-6.